Scottrf wrote: Elite Player Squad squad. I offer no defence, only apologies. TightHEAD wrote: It is if you're in it! He's one of 5 scrum halves in the EPS squad. Of the three that weren't initially picked, Wigglesworth is the most experienced by far. People are getting hot and bothered about it but the reality is he's never been that far away from a call up. Not being in the match day squad is a cold place to be for anyone. EPS or not. I disagree. He had as much chance to play as Alex Lozowski, in so much as he is 3rd choice and it would take injuries for Losowski to get a cap this 6N. Arguably he's in a better place actually, because it's extremely likely that 2 9s are named in a matchday squad. That's less clear for Loz. Ultimately I'm sure Wigglesworth would like to be training with England as 3rd choice, but I'd hardly consider potentially being just 1 injury away from being in the matchday squad out in the cold. The call up of Wiggleworth does go against the grain a buit for Eddie though. Hes previously opnely stated and been keen on sleecting players he wants to take a gamble of having the potential to be exceptional and bring a new level as a potential first choice over those who are good but unlikely to be great place fillers. Wigglesworth you'd feel fits into that second category, hes failed to establish long term places in worse England sides than this and is no spring chicken/long term option. Hes no more an outsider than the other two options yes, and has bags of experience playing with Farrell should they shift to the old Lancaster closing axis. Maybe Jones just doenst rate Robson as highly as the internet does. It is a suprise but maybe not a shock. I trust his judgement anyway, Jones has shown he gets it right more often than not. I disagree. It's a cold lonely place. TightHEAD wrote: I disagree. It's a cold lonely place. It'd be nice if you explained why. Jones has pointed to weaknesses in his defence before. In all honesty I don't watch enough of Wasps to know if this is a fair criticism, but it does at least offer an insight as to Jones' thinking. Gooseberry wrote: The call up of Wiggleworth does go against the grain a buit for Eddie though. I don't think it does go against the grain as much as people might think. To me, it's all a question of timing. Eddie has a strong bias towards youth in his training squads, but he likes people to spend time in the EPS and in camp before he gives them their first cap. He's had no time to do that now, so he turns to a proven campaigner. It's very similar to what he did with Wood last year, and even what he's done with moving Chris "not a 7, more a 6.5" Robshaw back to openside. But absolutely, Wiggy's call up is likely short term and I would bet that he won't tour this summer. And I agree that t'interweb rates Robson (and Wade, Ewers etc) more highly than Eddie does. Fair point. If youre already having to hide Ford someone who can tackle is pretty important, although Id never seen Wigglesworth as especially strong in that regard. We can argue all day about where the line on cold is, but a 28 month gap for caps is pretty substantial. Youd think that he mustve been doubting his chances of adding to his caps when pushing 35. Theres bigger issues in the England squad than SH injury cover though. The injuries will test squad depth now they are up against quality opposition. Fords defense isn't weak, massive misconception just because he doesn't knock people backwards. TightHEAD wrote: Fords defense isn't weak, massive misconception just because he doesn't knock people backwards. ...and Jones having stated he has to hide him in defence. Please lets not start this one again. ...and Jones having stated he has to hide him in defence. Hopefully that will make the opposition attack the Ford Channel all game long. I didn't say you should, but you could, and I think that would be nice. Personally think this forum would get pretty stale if people simply repeated their viewpoint over and over without ever explaining it. cascough wrote: Personally think this forum would get pretty stale if people simply repeated their viewpoint over and over without ever explaining it. Nope. Never seen that happening on here. Wouldn't want it to start now. Whilst I wouldn't have picked Wigglesworth, there aren't IMO some new young talent at 9 putting their hands up IMO. Yes I realise there's the likes of Maunder,Robson and Spencer but I don't think they've been really lighting up the AP. It's not a situation like Simmonds where he was clearly the 8 of the moment. Do other 9s have potential to be exceptional? Not convinced as of yet. Have to say this thread is much more pleasant and good natured than the Wales v Scotland one last week. Kudos folks! TightHEAD wrote: My main concern with Wigglesworth coming back in from the cold is that Richard Hill contacted him, Steve Borthwick praised him. Seems to be a bit of a Sarries jobs for the boys attitude creeping into the national side. That will help no one long term, I hope Eddie stamps on it now. He was in the EPS squad. That's hardly "the cold". Was an EPS ever formally announced? I know that there is one, to enable the various payments, but was it ever announced? The Oracle wrote: Have to say this thread is much more pleasant and good natured than the Wales v Scotland one last week. Kudos folks! You can take you positive comments and make like a tree!!!!!!! You'll probably receive an email or some kind of warning about the security measures in place and leave yourself plenty of time to get in, but this doesn't in any way, prepare for you for the utter shambles the security set up is. From someone who queued up at 12.45 at Gate 1 and got to my seat just as the ball was kicked off without stopping for a drink/toilet, trust me, go straight to the ground and don't drink too much beforehand. Also - Walkabout don't let you in unless you have photo ID, which no one tells you until you've got to the front door after queuing up for half an hour. You deserve all you get for queuing half an hour for such an abomination of a bar. But pretty standard and I think most people carry photo ID? Are you sure you're talking about Twickenham though? No it wasn't actually, at Eddie Jones' request. I only know who are the 9s because several journalists clarified it with Jones after the rumours that they were looking at Velacott. I know he is getting on but didn't Wiggy cover winger in his youth, my memories are that he was pretty nippy. Look to play with pace with Simmonds a linking, carrying 7 and pressurising Patchell, Robshaw and Hughes to scrag Davies, Hughes a more powerful direct carrier to mix up the form of our carrying attack, focus on the breakdown and spreading out carrying duties, try to narrow the Wales defence and use the cross field and chip kicks a lot with playmakers with good attacking kicks at 9,10 and 12 and a lethal kick chase. Force them to defend wide by this then switch up to flooding the inside channels (for this tactic I’d start with Teo and then bring on Joseph once we switch to the inside flood). If he drops a lock, no doubt in my mind he's starting Te'o. I'd suggest he would like to start JJ, which means he will play a lock at 6. I just cannot see a world* where JJ starts and he drops a lock. *If Billy or Hughes were fit this would be different. Hughes might be fit though! ChequeredJersey wrote: Hughes might be fit though! Unlikely based on the quotes explaining his call up. Itoje / Launchbury / Lawes / Robshaw is a decent set of jumpers with at least one very disruptive jumper. We could add Kruis in place of Launchbury and lose a little carrying but gain in the air and the scrum. Now that Eddie has allowed Robshaw a 7 shirt again, the back row on Sunday had a kind of unorthodox balance to it. Simmonds and Robshaw got through an immense amount of work and I think that compensated for any deficiencies in having a lock at 6. I don't know if that's what Eddie will pick for Wales, but if he does it would be interesting to see how it goes. You've got too many options, England! That's your problem! Fun fact. In the under 20 equivalent of this game the two opposing captains Reffel and White are club mates in the Tigers academy. I'm not sure Wigglesworth would have been my choice but he does offer a very different option to Care. Care didn't cover himself on glory against Italy, he never really threatened to control the game. Wigglesworth might exert more control and offer a more tactical option for England and maybe stop the Scarlets influenced Welsh attack playing too large a part. 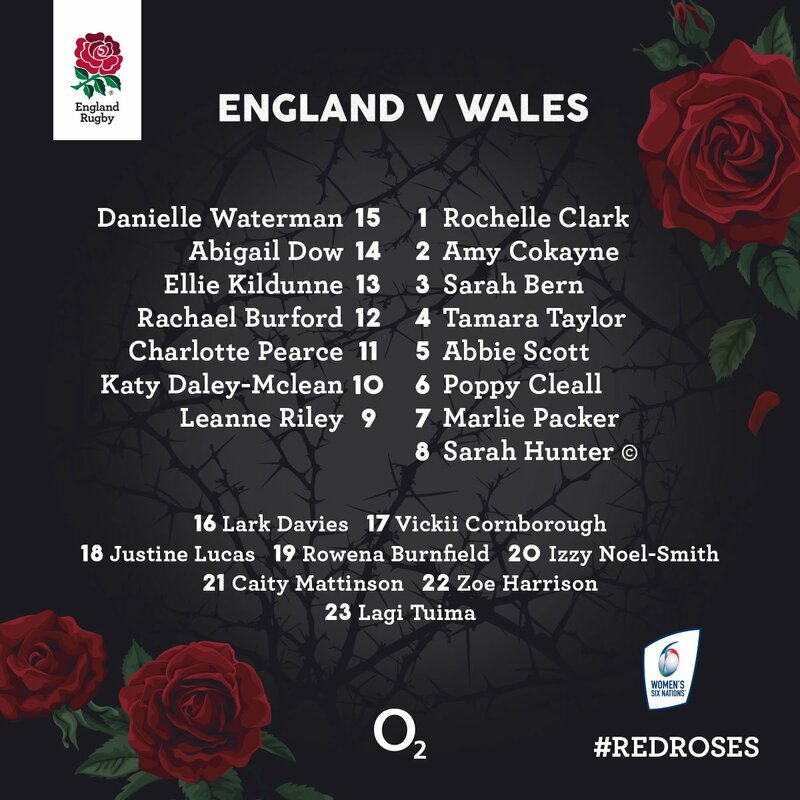 England have never really asked too much of their 9's, we usually want a safe player who can pass, kick and tackle well, breaks and tries are very secondary to those things, we don't even get them to motivate the forwards and dictate plays, all that comes from the 10s. Scrum half is just a link between the ruck and the flyhalf. The poor, unloved, under-appreciated feckers! Hmmm, I'm not buying it though. I've seen plenty of dart and weave and pace setting and evasion and space creating and line breaking from England's 9s. Me neither, if that was the case then Wigglesworth would've always been England's first choice throughout Eddie's time in charge as he has by far the best passing and kicking game of all the English SHs. I'd argue that both Youngs and Care fall half-way between these 2 types of games with solid - but far from perfect - basics and the ability raise the tempo and offer a sniping threat. Honestly 'scrum half is just a link between the ruck and the flyhalf' and 'England have never really asked too much of their 9s' in particular just look like pre-emptive barbs incase the Quins man ends up on the bench. That should really be unnecessary though, Care is far from a one-trick pony and can run the game from the start. His basics are no worse than Youngs' and if he starts ahead of Wigglesworth so should Care. Nothing like that at all, I was just saying it as I see it. Yes there'll be some breaks but I just think that the 9s primary job is kicking and passing. Breaks can happen but rarely. I'd be happy with Wigglesworth starting btw, care always seems better coming on. Maybe that extra time to analyse play from the sidelines helps him spot things too. Limited data and mainly my perceptions, but after Youngs injury England took longer to get the ball from the nreakdown into the First receiver's (usually Ford) hands. Now multiple factors affect this, not just a change in SH but it may be one of the reasons that the Tiger tends to start ahead of teh Quin. I hope it does not impact on this weekend though. Care is the better SH nowadays and unless we plan to play it tight better suited to being on the field for the longest amount of time. As to a previous point about hiding Ford in defence - we are obviously pretty rubbish at it as he was the only back whose tackle count hit double figures. Why do Wales announce their team so early? TightHEAD wrote: Why do Wales announce their team so early? Because they only have 23 international class players. Hey, this thread was getting a bit tame and respectful. So how many 'World Class' do they have? Should be enough for the win. Josh is the leading scorer in the Aviva Prem, so he has to be world class!!! !